You’ve met with so many investors, it’s hard to remember what exactly you’ve told each one you’re selling. Real estate? Agriculture? Communications? Transportation? No matter. You’ve approached these investors because they don’t ask a lot of questions. They are much less interested in what you’re doing than in the promised payday you’ve said is on the way. Of course, they don’t know that the interest on their investments will be paid by other, later investors in your enterprise, who will in turn be paid by other investors, and so on. It all seems so manageable to keep the wheel turning. Until all of a sudden it isn’t. Think you can make a quick buck without going bankrupt? Enter the world of Ponzi Scheme. 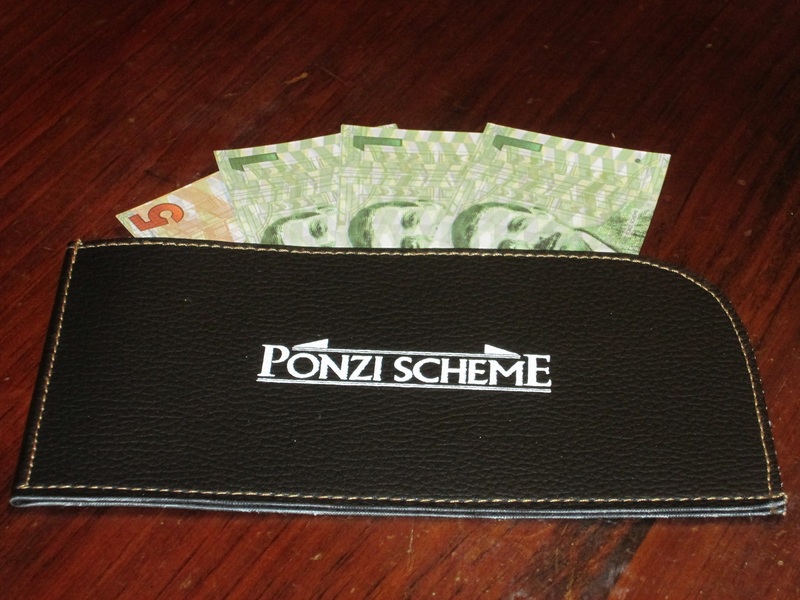 Ponzi Scheme is an economic trading game for three to five players. Players are fraudsters luring investors with impossible promises, trying to build the most profitable shell companies. 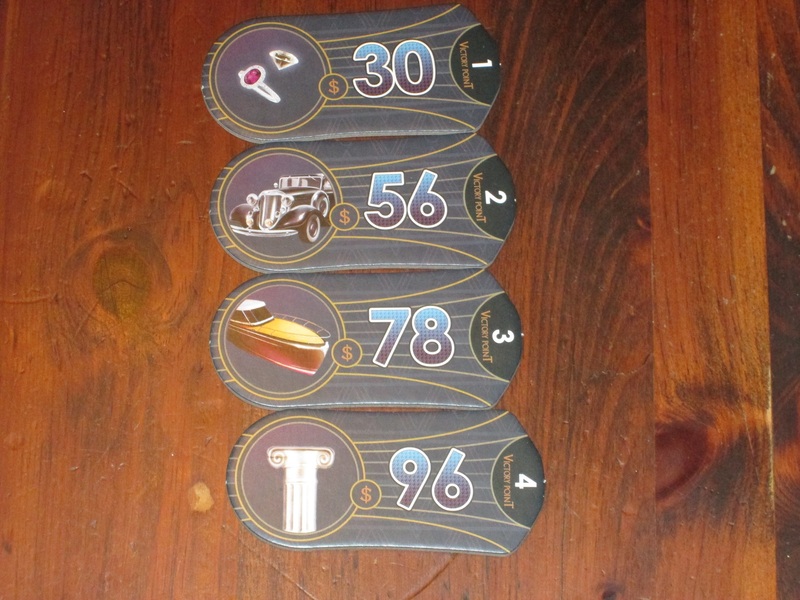 The player with the most points in industries (without going bankrupt) wins. 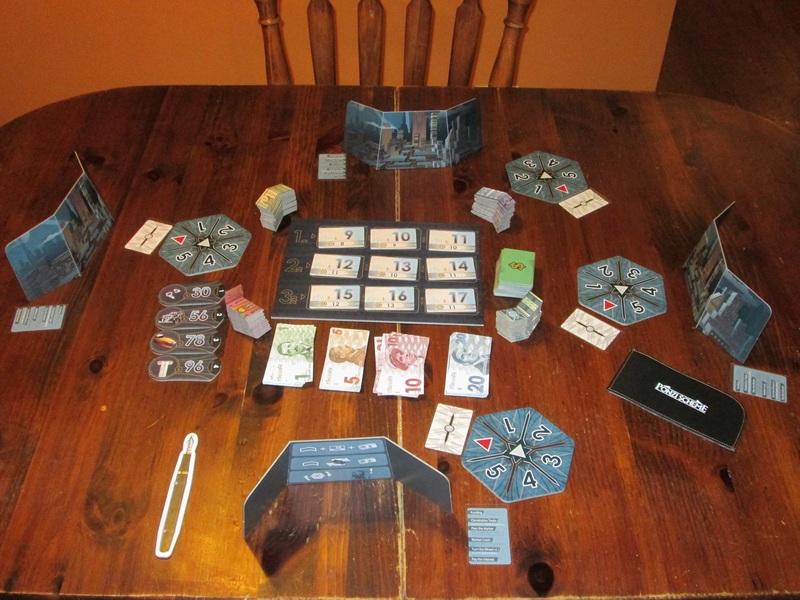 Ponzi Scheme set up for four players. 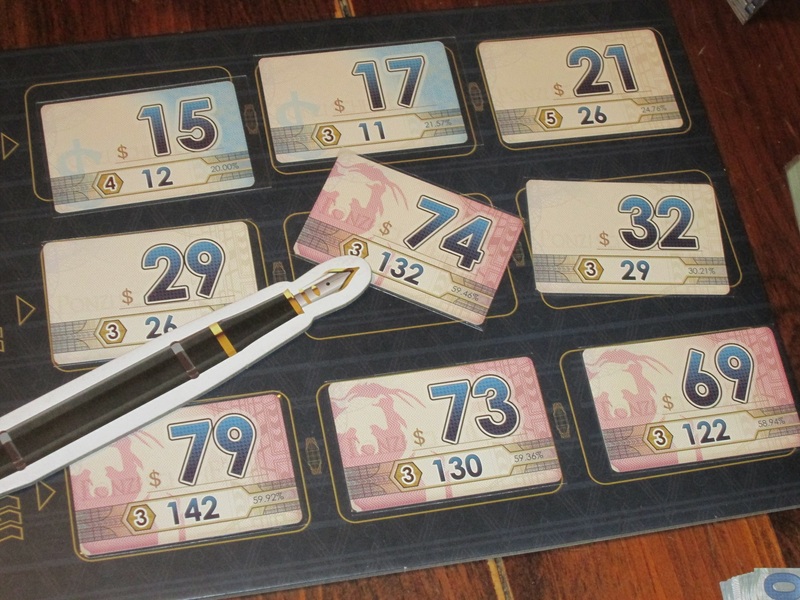 To begin, players receive an investment wheel, a time card, and a player screen. The starting investments are arranged on the investment board, and the investment deck is shuffled. The time card is placed by the arrow on each investment wheel. One player is given the start player marker. A round follows several phases, and players play each in turn. In the first phase, players may take an investment and an industry tile. There are four kinds of industry tiles, and players must take an investment corresponding to the level of the industry they’re taking. (For example, if it is the first industry of a type, they take from the top row; if the second, the middle; if the third, the bottom.) The investment is placed around their wheel according to the number on the investment, and the player receives cash equal to the big number, which is kept behind the player screen. The player aids help players remember the small ruleset. These are nice to have, although the back of them (on market crashes) is hard to read because of the font color choices. 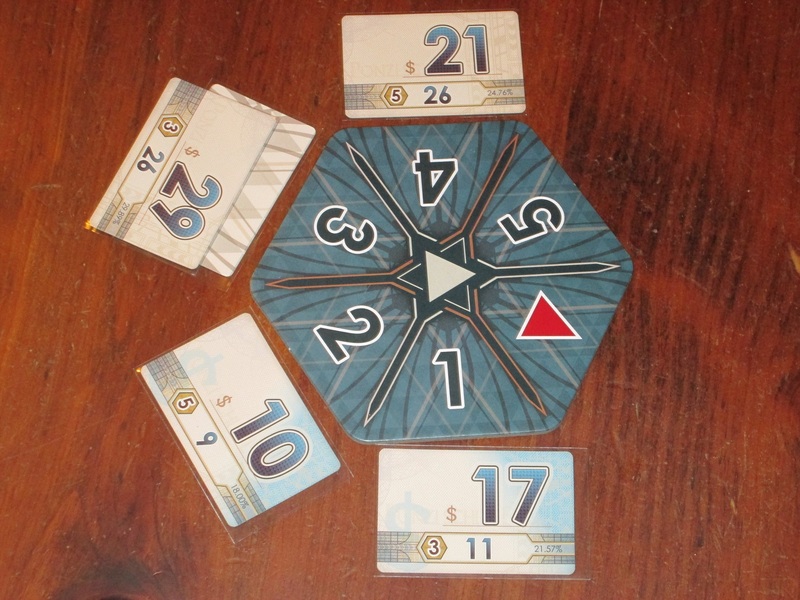 Once all players have conducted a clandestine trade or passed, the start player marker passes clockwise, and the new start player removes one card from the investment board, which is replaced from the deck. If there are bear cards equal to or greater than the number of players, the market crashes: each player loses one industry tile from the industry they have the most of, and they rotate their investment wheel two spaces. 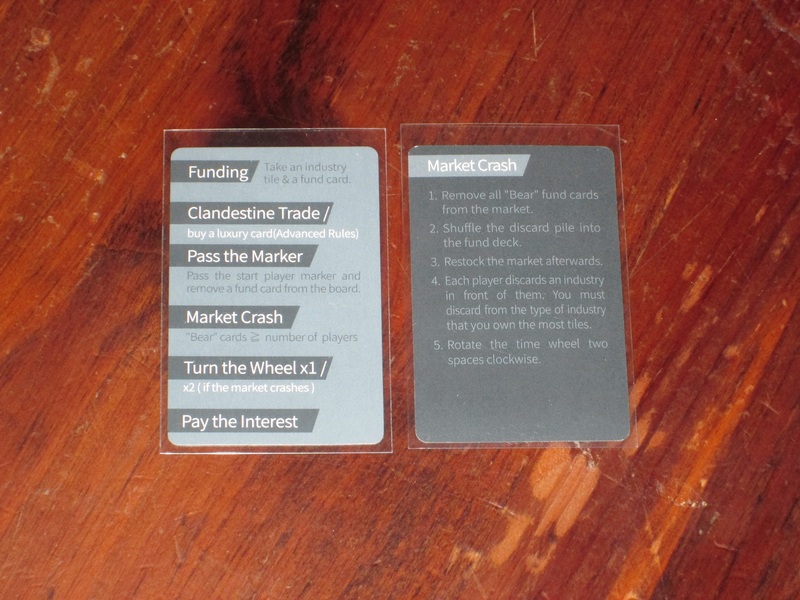 If there is not a market crash, each player rotates their wheel once. Any investments that the wheel has passed or is pointing at must now be paid interest. Once interest is paid, the investments move later on the wheel, to the number specified on the investment card, and a new round begins. The best and worst funding cards in the game. The big number is how much money you get when you take the card. The small number tells you how much interest you have to pay each time it comes up on your wheel, and the number in the hexagon tells you how often you have to pay the loan. There is also a percentage that helps you see at a glance how much of the loan, essentially, you are paying back each turn. The game ends whenever one or more players is unable to pay the interest on their loans. Any bankrupt players automatically lose. At that point, players score points for industry tiles and money leftover. The player with the most points wins. Top of the Pyramid, or Bottom Feeder? Ponzi Scheme is unlike any other game I’ve played. You walk in with almost a sense of despair: as soon as you take your first funding card, you realize that someone is going to go bankrupt. And a great deal of the game is in trying to ensure that that person is not you. For some, this prospect might seem grim, or the relation to the actual Ponzi and his scheme might hit too close to home. 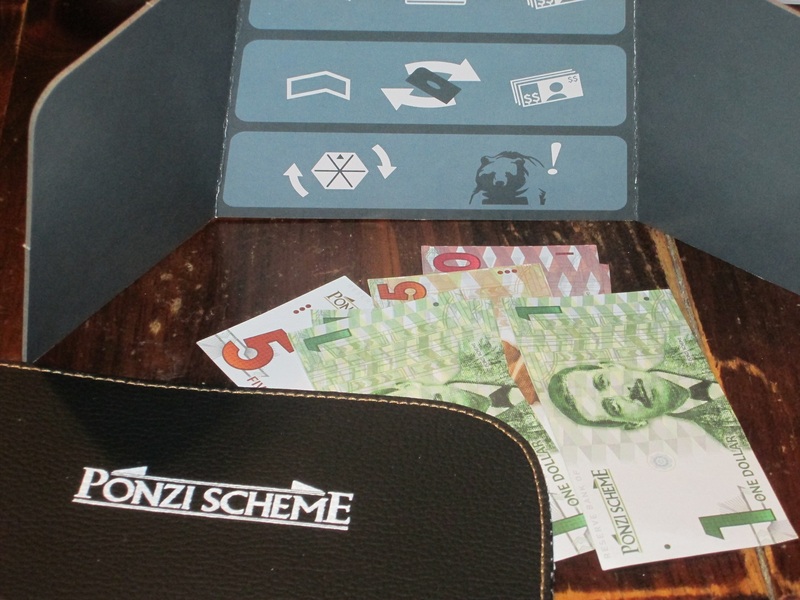 For me, Ponzi Scheme strikes just the right balance between tense gameplay, transgressive theme, and gleeful social interaction to make an enjoyable experience each time it lands on the table. I think Ponzi Scheme is a hit. The funding board in Ponzi Scheme. The board is arranged so the three smallest funding cards are always at the top, and the three biggest are always at the bottom. At the start of the game, each player is looking at their investment wheel, thinking, I’ve got time to pay this off. 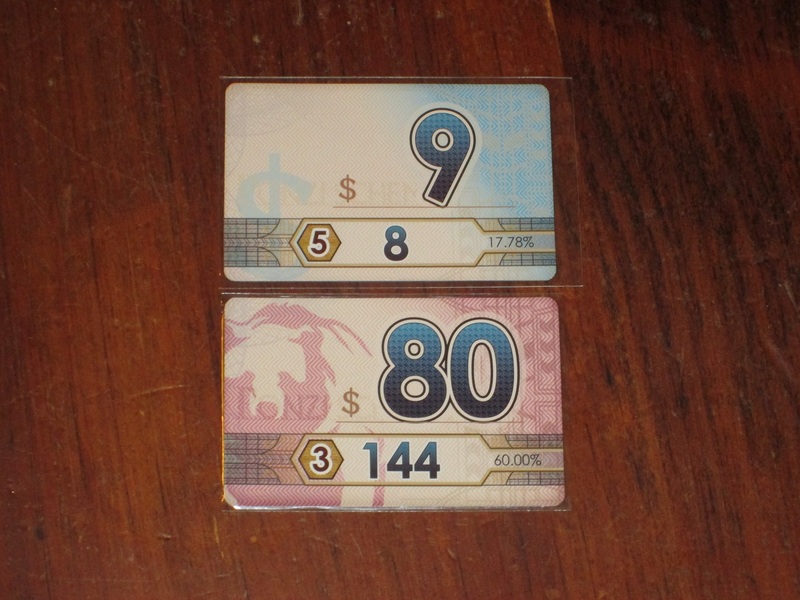 The funding cards at the start of the game, while still charging exorbitant interest if you stop and think about it, carry a low financial burden compared to later cards, and you can become almost lackadaisical in your approach to repayment. Sure, add another loan to the wheel. I can handle it. As the game goes on, it becomes clearer and clearer just what a hole you’ve dug yourself into, and for each player, there’s usually a point, a spot on their wheel, that they know is doomsday: when interest comes due at this exact point, there are no further opportunities to stay afloat. Bankruptcy is at the door. So the game is in timing this correctly so that your doomsday spot is after someone else’s–and in making sure that you have more points than the other players who haven’t gone bankrupt. The new start player gets to remove a funding card from the board. If there are ever bear cards equal to the number of players (as in this case), the market crashes. One of the most exciting things about Ponzi Scheme is clandestine trading, and the game’s components help facilitate this. Clandestine trading is grueling because it is done in secret. You pass a wallet full of money to another player, and the other player decides whether to meet your offer or take the money. To offer a clandestine trade is to have skin in the game: you can’t offer to buy something unless the other player is a competitor in the same industry. So at the end of it, you’re going to come away either richer and less invested or poorer but with a larger stake in your shell company. So getting your trade right is tricky. If you offer too little, you’ll get bought out. But if you offer too much, you’ll be in a worse position for paying off interest and for fending off other investors when their turn for clandestine trading comes along. The fact that money is hidden in the game and that after the initial investment you can’t keep track of it also heightens the tension here: it’s hard to say what a good offer is and what another player would be willing to take. The other players’ finances are a closed book, and since players aren’t allowed to mention amounts of clandestine offers, even when someone takes the offer, you still don’t know whether it was a good one. 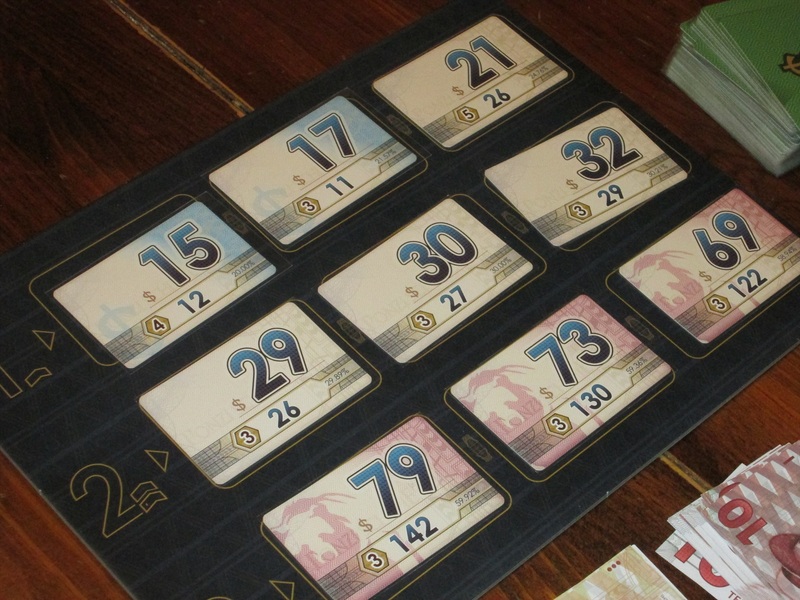 Money is kept hidden behind each player’s screen in Ponzi Scheme, making clandestine trading exciting each time it happens. I like that the game funnels players toward clandestine trading. In my mainly Euro group, sometimes even if a game includes interactive elements, players will eschew them in favor of tending their own gardens. But there’s no real way to avoid clandestine trading in Ponzi Scheme. The most industry tiles of a type that you can take through the funding board is three, and usually the level-three loans are unattractive. So the best way to grow your industry is to wrest it from someone else. This is also a balancing factor in the game: point-rich players are usually cash poor, so this gives the other players at least a chance to swing the game in their favor. In one game I played, I was certain another player was hurting for cash, so I made a low-ball offer on one of his industry tiles. It turns out that my offer was too modest; he bought me out, and I had to cough up one of my tiles instead. Adding insult to injury, another player made an even more modest offer to the same player, and he was forced to accept it because he bought out my offer! The dynamics of the game are so interlocking that it’s hard to parse with certainty what the best deal is and what another player will accept or reject. This is purely an artistic rendering. 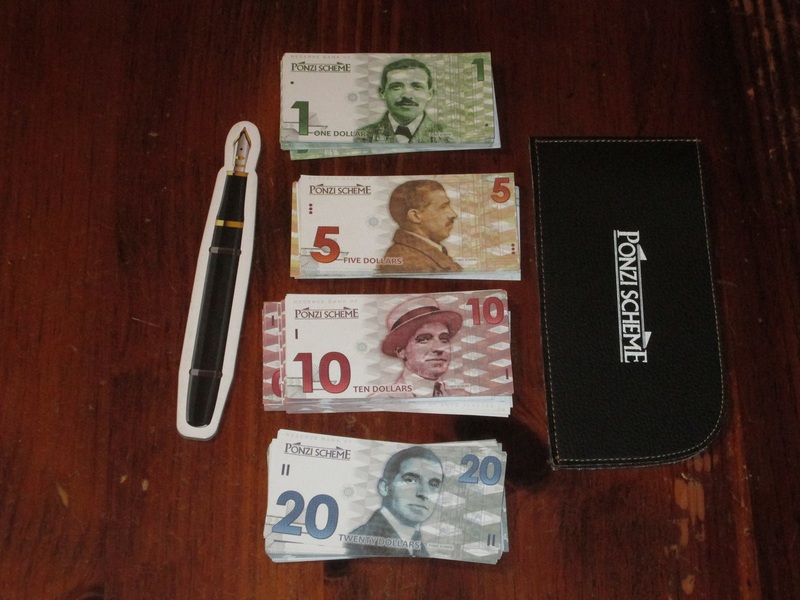 In the game, the paper money is neatly hidden in the included wallet (which is an excellent component choice). And that is one of Ponzi Scheme’s greatest strengths. It’s an economic game that doesn’t devolve into endless calculations. Sure, it can devolve into calculations, but there’s enough hidden information in the game to render excess calculations fruitless. This keeps the game moving at a brisk pace and places the agonizing decisions in players’ hands: how far can they push their investments so they can be in the best position to win when the game ends? The game is really pulling players in two directions: it’s urging them toward a more conservative financial approach, since one player will go bankrupt before the game ends, and you don’t want it to be you. 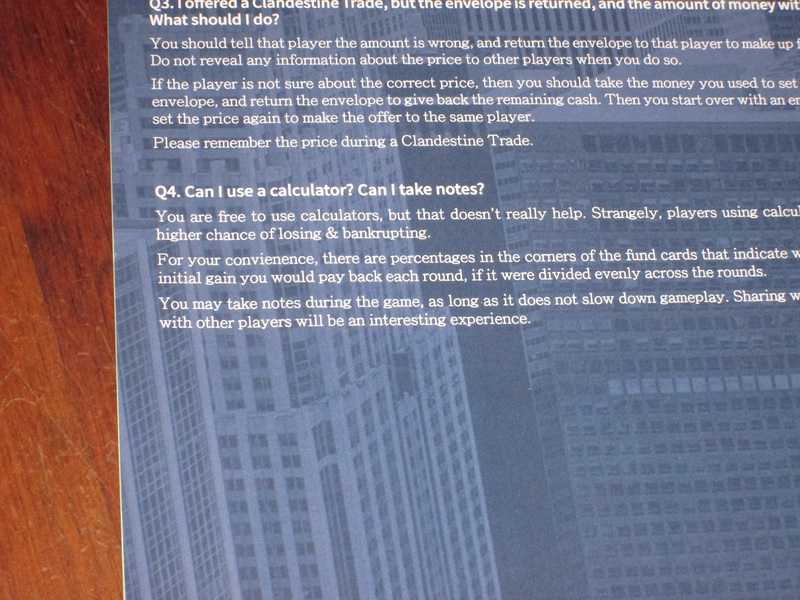 But the game also urges players toward big risks: if you don’t take enough high-income investments, you will get bought out through clandestine trades and will be unable to score the points you need to win the game. Further, the deeper you invest in an industry, the larger loan you have to take. All the decisions in the game hang somewhere between balancing these competing impulses. And what makes the game exciting is there’s no way to know with absolute certainty whether your mix is going to carry the day. A further way the game funnels players into interesting interactions is through its money. Money is worth either nothing (in the advanced game) or very little (in the basic game), so it behooves players to spend their money during the game, either by buying luxury tiles or through clandestine trades. The luxury tiles in the advanced game are interesting because they are a safe investment. Unlike industries, which are affected by market crashes and are the targets of clandestine trades, luxuries are set points that you cannot lose. However, in order to achieve the safe investment, you have to pay an exorbitant amount of money. This is fine if the game is ending and you have the cash to burn…but even here, it’s probably better to buy out other players’ tiles. Or is it? Money for luxuries is paid to the bank, whereas clandestine trade money goes into the opponent’s coffers. By purchasing their points, you might be keeping them afloat for another round. Decisions, decisions! I said at the outset that Ponzi Scheme is like nothing I’ve played, and that’s true. Mechanically speaking, it represents complex economic calculations in a fairly intuitive way. 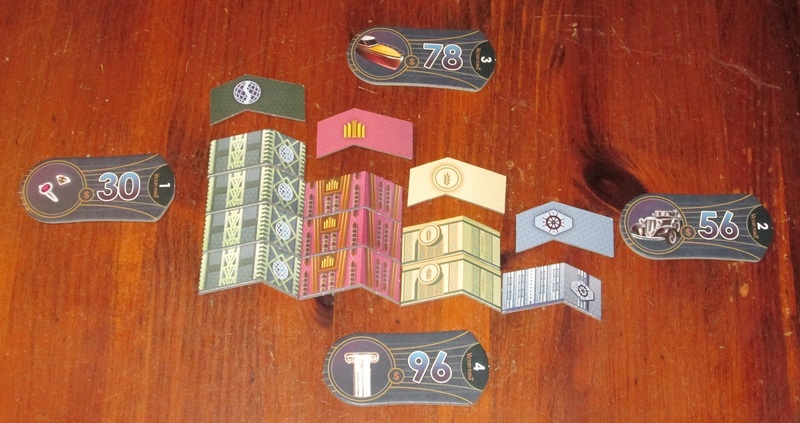 It’s a strange blend of meaty economic game and raucous social game. The rules are simple, so it’s easy to teach, but the decisions players have to make are tough. It’s just that these decisions are often socially motivated: you can’t ignore the other players. Even the decision to take a funding card and which one to take has consequences for the other players. It gives you new money to play with in the trading phase and gives you another industry tile, and it might allow you to stave off bankruptcy for another round. Taking a funding card might also add a bear to the market, meaning a crash is imminent (and you have to watch other players here, too: if you can weather the storm better than they can, it might be worth it to try to crash the market). I like that Ponzi Scheme keeps players looking into each other’s eyes, and I also like that the rules are simple enough that conversation around the table is not only allowed but encouraged. It can sometimes take time for a player to come up with just the right clandestine trade offer, so it’s good that the game creates a more conversational atmosphere. But it’s also interesting when it’s not your turn: watching clandestine trades is the best part of the game, especially when the person who receives the wallet doesn’t make an immediate decision. Like Medici, Ponzi Scheme is about finding the right number to make the next person squirm. I think Ponzi Scheme is great, but I do have a few reservations about recommending it to everyone. First of all, Ponzi Scheme won’t work right if players insist on calculating every penny. Ponzi Scheme, more than other economic games, needs to be played from the gut. That’s not to say there isn’t strategy or that all calculations are fruitless, but players need to realize the limitations of calculation in the game. The rules even speak to this: “You are free to use calculators, but that doesn’t really help.” All of this to say, if you play with players prone to analysis paralysis who will not move forward unless they’re certain they’ve made the absolute best calculation…you might want to seek your fun elsewhere. Ostentatious displays of wealth are encouraged…and retain their value. Also, while I love Ponzi Scheme, I do wonder how much of this love is related to novelty. There’s a certain love that comes with anything that’s new or unique, so it’s hard to say whether the glow around the box is because the game will always be fun or because I am currently enjoying discovering it. I suspect that because the game is so interactive and dynamic based on the different personalities at the table, the fun here is inherent in the game, but it’s something to be aware of. The game offers such a different set of decisions from what I’m used to that it’s hard to compare it to other games’ longevity. The components in Ponzi Scheme. Everything is on thick cardboard (except the paper money) and is practical, but the components won’t make players stand up and take notice. And the final thing to be aware of is the price. The game retails for $59.99 MSRP, and compared to other games at this price point, the components here are…just okay. That’s not to say that what you get in the box is bad or isn’t worth the price. The cardboard is thick, the cards are nice, and the wallet works great. Everything is functional, and there’s a decent amount of cardboard–the box is heavy. It’s just that making a lateral comparison to other games at this price point makes Ponzi Scheme look a little shabby. This doesn’t bother me too much–gameplay-wise, I think the game is worth the price, and games are more than their components anyway. But while everything in this box works well and looks good enough, I don’t think it will wow passers-by with the physical object. They might stop when they see the laughing and table talk, though. The industry tiles and luxury tiles: the only way to score points in the game. 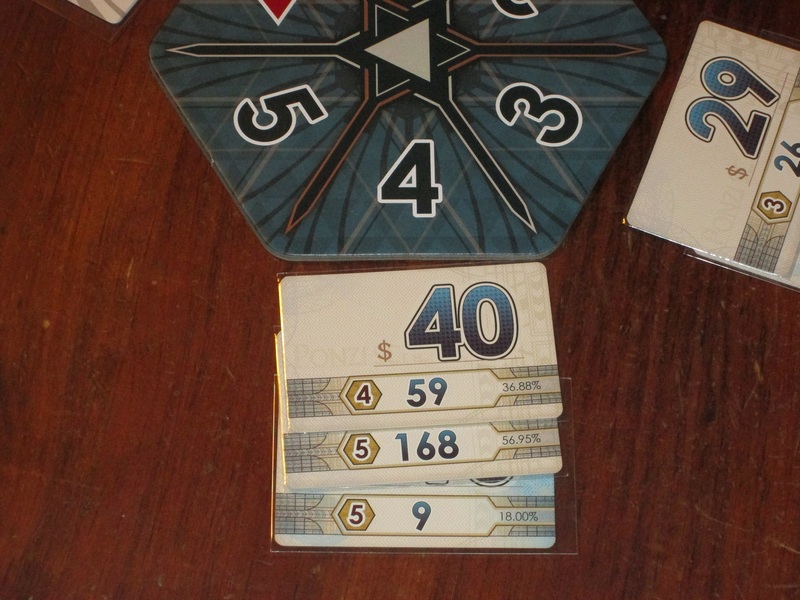 Ponzi Scheme advertises play with three to five players. I’ve played at all these counts, and while it works at all of them, I like the four- and five-player game a little better. There’s less room to hide in the larger game (especially the five-player game: there is guaranteed potential for a clandestine trade on the first round! ), and I think this game benefits from a the-more-the-merrier approach. It’s all about the Benjamins! Except it isn’t. Money is worth very little (or nothing) at the end of the game. Channel that money into bogus industries, quick! Ponzi Scheme is a surprise hit with me. It’s a surprise in that while I expected to like it, I didn’t expect to like it as much as I do. It’s on the faster end of economic games (75-90m) and it’s simple, making it something I can introduce at various groups and still play something else in an evening. While the rules are not complex, the interactions are, so I’d probably still recommend this one for experienced gamers. 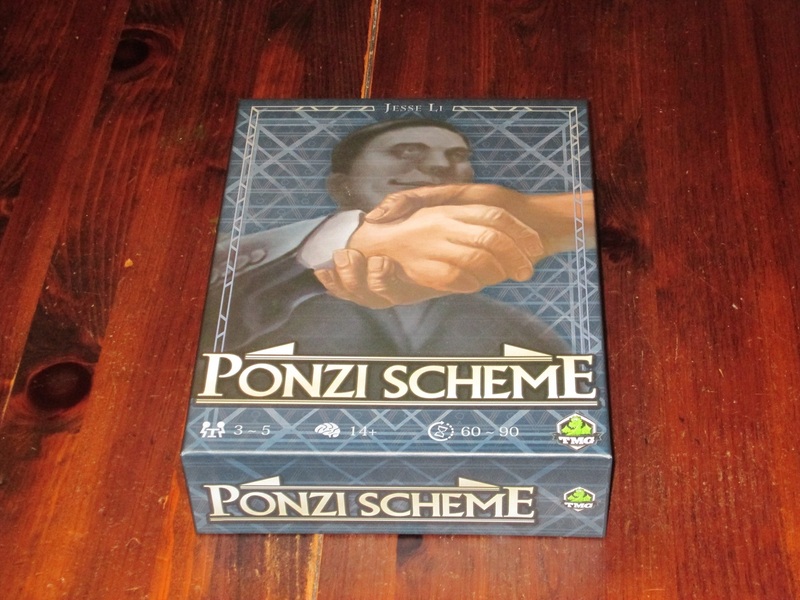 But for a light economic game, Ponzi Scheme offers lots of tense choices and fun interactions. It’s one I intend to keep in my collection and rotation. 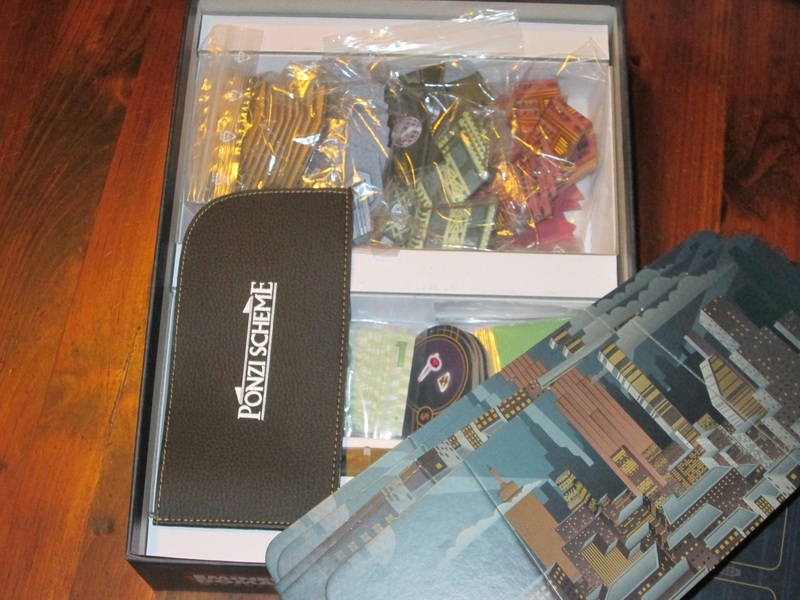 iSlaytheDragon would like to thank Tasty Minstrel Games for providing us with a copy of Ponzi Scheme for review.